My mum and dad, Susan and Stewart for their incredible help • my girlfriend Silvey for still being my girlfriend • My uncle Patrick Wade for building out the uni • My uncle Andrew Wade for tons of gear and advice • My grandma Enid Wade for supporting me in everything I do • Uncle Victor Van Buskirk for helping with my launch • My sisters Hannah and Kate for believing in me • The rest of my incredible extended family • Cathy Orlando of the Citizens’ Climate Lobby • Rita Bijon, Frances Deverell, Lyn Adamson, Margaret Rao, and everyone else at ClimateFast • Que Bahn for all her help organizing in Victoria • Keith Chan of Island Trails Photography and Garth Racicot for official photography • Kristina at Sierra Club Ontario and Mikaela at Sierra Club of Canada • Joy Illington and Michael Nation • Andrea at Council of Canadians • MP Alex Atamanenko and staff Lilly Zekanovic • MPs Matthew Kellway, Ted Hsu and Megan Leslie • MP John McKay and staff for organizing a parliamentary press conference • MP Elizabeth May and staff • BC MLA Gary Holman and staff Ryan Painter • BC MLA Andrew Weaver and his staff • MLA Carole James • Councillor Alicia Cormier and the rest of Central Saanich council • All the incredible small businesses that have supported me through in-kind donations and private sponsorship including… • Eric and Johanne and everyone at Hartley Insurance in Victoria • Vancity for financial support • municicyle.ca for a great discount on the uni • Bob and Lucinda of Wild Ways in Christina Lake BC • North Park Bike Shop in Victoria BC • Denman Print Works in Victoria BC • Metropol in Victoria BC • Bikes and Beyond in Winnipeg MB • Tom and RJ of Bored Room Bistro in Midway BC • Imperial Motel Grand Forks BC • Darcy of Darcy’s By the Bay in Waubashene ON • Beth and all the friendly folks at River Haven Resort in Britt ON • The Downtowner in Creston BC • Kootenay River RV and Kampground BC • Daisy May Campground in Fort Macleod AB • Fieldstone Campground Moosomin SK • KOA Winnipeg MB • Helliars Resort in Nestor Falls On • Hay-U-Ranch Resort in Yahk BC • The Inn at Redmond House in beautiful Maple Creek SK • Anicinabe Campground Kenora ON • Bry-Mar RV Park Brandon MB • Willow Tree Spa Hope BC • Beverly Hills Resort in Christina Lake BC • Crawford Bay Inn BC • Pinewood Motor Inn Espanola ON • Serpent River Campground Sprague ON • Elizabeth and Camp Barcovan in Carrying Place ON • Wakamow Valley in Moose Jaw SK • Moose Lake Cottage Resort ON • Mohawk Motel in Massey ON • The Fenix in Picton ON • Puddingstone Harbour Resort ON • Sand Lake Campground and Cottages ON • Yazel, Jack, Denis, Brian, Liz, Steve, Rajiv, Jason, Heather and Diana for your donations which made the campaign possible • Plus…• Andrew Tuovinen • Paul Gatien • Andrew Dodd of Dodd’s Eye Media • All the performers at the Sidney BC Launch Event including Nostic, Inglewood, Audrey Lane Cockett, Morgan Purvis, Caleb Kennedy _ Family and Hayden _ Meagan • Greg Holloway, Doreen Webb and the whole ‘Aery Faery Tangent’ • Former Victoria Mayor Dean Fortin and current Mayor Lisa Helps • Oliver Giving • Judy Fraser • Andrew Tuovinen • Neil Smith • Andrew Slade • Glen and Sherry in Mission BC • Professor Steve Lapp, Gillian and family in Kingston ON • Vic, Nat, Riley and Gary in Hope BC • Councillor Kim Maynard and Dierra of Princeton BC • Emmy of Crowsnest Bakery, pastor Jason Weibe and family and mayor Manfred Bauer in Keremeos BC • Alex Smith of Radio Ecoshock • Ulli Diemer • David and Helen of Wolseley SK • Doug and Shirley in Ottawa ON • Mayor Brian Taylor of Grand Forks • Brenda Tyson and the children of Pinewood Elementary in Cranbrook • Eleanor and Dan, Paul Pichurski and the children of Isabelle Sellon and everyone else in Blairmore AB • Kelly Babcock in Ottawa • Marvin and Darlene in Portage la Prairie • Heather and Richard in Winnipeg MB • Max and Joe in Duluth MN • Shawn in Biwabik MN • The Orton family in Blind River SK •Liz Couture and everyone in the Richmond Hill ON NGO and business community at the Performing Arts Centre • Svend in Oshawa ON • Bart and Judy in Port Hope ON • Anita and everyone of the Northumberland Cycling Club, ON • Librarian Christine in Picton ON • Cal and Patty in Regina SK • Megan and Andrew in Medicine Hat AB • Sandy and Wendy-Anne in Manotick ON • Doug and Shirley in Ottawa ON • Sue and Charles in Ottawa ON • Everyone who showed up for my arrival on Parliament Hill and everyone who followed my progress online! When dozens of environmental organizations united behind Bill McKibben’s 350 to organize a climate change march in downtown Manhatten, they promised it would be the biggest protest in the history of the movement. And boy were they right! But the march drew more than a crowd. Before the first traffic cones went down, the first banners were raised or camera tripods unfolded, the People’s Climate March had drawn fire for being too soft on stagnant government inaction, without firm goals or clear political objectives. NOTE: This article originally appeared in The Environmental Advocate, published by the Conserver Society of Hamilton. Reposted with permission. 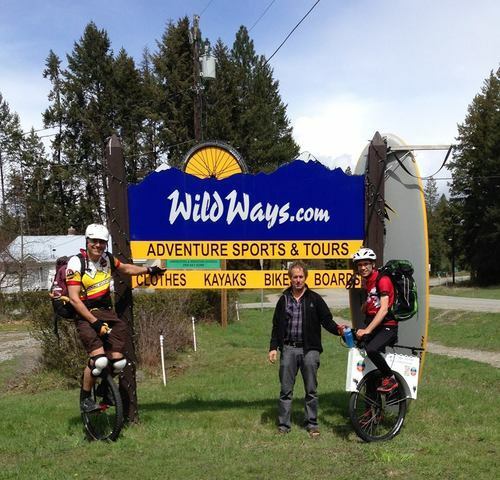 Unicyclist Cam Rawinson, left, and business owner Bob Dupee, centre, were just a few of the generous strangers who jumped head-first into helping me unicycle 5,000km across Canada. What can I possibly hope to achieve? In as many words, that’s the question I get asked by the most people; supporters and skeptics alike. 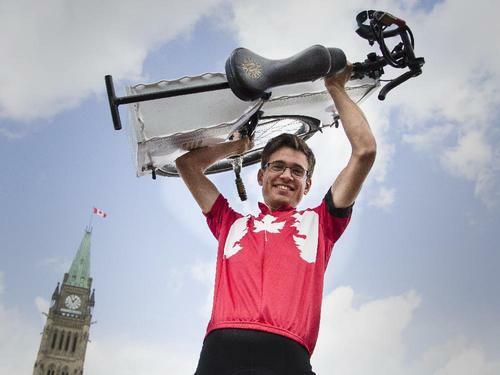 And I don’t blame people for laughing off the idea of using a unicycle to spur political action on climate change, even though I’ve used the ‘gimmicky’ device as the basis for a 5,000km cross-country ride that has brought me in contact with dozens of reporters, scientists, politicians and thousands of concerned Canadians. The truth is, while I’m confident I’ve helped surface, in some small way, the urgency we should all be feeling about the climate crisis, I have no idea whether or not I’ll be able to reach our elected leaders, much less contribute to a movement to force them to address our climate concerns. But still, when you ask me what I hope to achieve, that will always be my first answer. My first answer, but not my only one. Selfishly, I was also hoping such a trip might bring me in contact with other advocates who have embraced the broad scientific consensus that we’re on track for absolutely devastating global warming within our lifetime. I was hoping that I wouldn’t feel alone. I was hoping to see my passion for political action to address the issue mirrored in others; to quell that anxious sensation that motivation and awareness for our own sustainability is simply too sparse in the everyday bustle of the great majority. I hoped to see environmental wisdom begin to take its place; climbing the ranks of more common concerns like career succession, family life, personal health, and material gain. Simply put, I suppose you could say I was hoping a shaky faith in humanity would be restored. And with more than 1,000km still to go, I can gratefully say my outlook on our society and culture has never been more positive. But wait a second, you say, are we really any closer to achieving an undeniable, overwhelming public consensus on the true severity of our predicament, much less the widespread political willpower to improve our fortunes? A little bit. More and more people believe in climate change as it hurtles brutally into their personal lives, and I’ve spoken to many of them first hand. Families whose homes have been battered by ice storms, hurricanes or shoreline erosion. Hardworking Canadians who find themselves suddenly jobless, like farmers who can’t cope with harsh cycles of droughts and ‘hundred year floods’ that occur mere months apart, or fisherman whose operations are compromised by ocean acidification and rapid mollusk die off, or loggers who find timber supplies sacrificed to pine beetle invasion. People are beginning to see how drastically unprepared we are for the relatively limited changes in our atmosphere, let alone the radical 6-degrees Celsius of warming forecasted for the next century or the 3-5 meters of sea-level rise that could swallow thousands of coastal communities in the following centuries or less. But the suffering of others, even if it’s necessary to generate adequate concern, is not the source of my optimism. Instead, my faith has been restored not as a result of any surprising evidence of environmental awareness, but through a constant demonstration of kindness, compassion, resilience and hope. These traits surfaced in every imaginable nook, cranny and corner of the country. From the wealthy suburbs of Vancouver and the hustling energy of its vast downtown, to the sleepy tourist towns and isolated mining communities scattered between the towering, snow-swept Cascade and Rocky mountains. Through the booming oil communities of southern Albert and Saskatchewan and the remote ranchland in between; From the pristine urban core of Regina through the rolling hills of Manitoba, down the rustic old streets of Winnipeg and along the rocky shores of sparkling Lake Superior in Northern Ontario. When my daily stops were separated by 80km over dozens of hillcrests and hairpin turns during frigid rain storms, or a mere 20km of flat straightaway forcing though hot prairie headwinds while staring down the grain elevators dotted on the horizon that never seemed to get closer. Whether on a quiet trail among fellow cyclists and hikers, or struggling to hold my line on the razor-thin shoulders of Highway 17 while fighting off gusts of smoky air pushed through the underbellies of looming 18-wheelers as they raced by. In all these places, on all these days, I quickly learned – out of necessity you might say – to trust my life with thousands of strangers. The ones I asked for directions, the ones I asked for help, and the many more who offered it voluntarily. The people I stayed with, ate with and entrusted my unicycle and backpack with. And, of course, the thousands of drivers from whom I requested by my very presence a portion of the roads they were used to owning alone. And I have been rewarded not just by surprisingly few negative encounters and close calls, but a long series of small, simple encounters that have brought me unexpected joy, and a few unforgettable conversations that have changed my outlook on life forever. Through the stress and anxiety of the narrow roads, the headaches and heartaches of fighting for climate justice and through the months of separation from the people and places and events I most cherish, I have been reassured by the welcoming charity of communities big and small. I feel at home wherever I go. As much as I’m a complete oddball, an ‘activist’ on a unicycle with sometimes controversial proposals, the common values and experiences that connect me with my fellow Canadians remain stronger than any of the quirky characteristics that set me apart. When my tire slipped on a gravel incline and my ankle got caught in the fork of my unicycle, it was like an anchor trapping me clumsily on the middle of the Crowsnest highway. Would the approaching truck driver even stop? Yes and he would make sure that myself and my unicycle were okay. I was hardly in a position to argue if he’d faulted me for riding a unicycle there in the first place; instead he wanted to make sure I could continue. When I got lost in a small town and had to interrupt a single mother juggling a household of children, she didn’t just give me directions. Chilled water and fresh baking were also provided. When people invited me into their homes to stay the night and spent the entire time apologizing for the temperature, the food, the mess; when they insisted I rest and wouldn’t accept help with anything. When a man on the Downtown Eastside insisted on giving me all his change so I could buy a coffee, because I was tired. When David and Helen found me with a flat tire and drove me an hour back to Regina and all over town on a Sunday evening to find a new tube. Then drove me back to dine with them. A few weeks later David and Helen were among thousands caught in the state-of-emergency flash floods that swept through southern Saskatchewan and Manitoba; the second such devastating floods to hit the region in four years. The recovery, I was relieved to hear, was swift and effective, as neighbours came together like neighbours do. When I met Derek who was cycling around the world with terminal cancer to raise funds for other survivors, and dozens of other cyclists who had taken months out of their busy lives to raise funds for loved ones. When I met Ted Musson who has returned for his second year of walking and re-walking the distance of Victoria to Ottawa to call attention to democratic injustices like the robocall scandal. When I marched with Idle No More protestors in Winnipeg to promote respect and action for future generations, and met people like Michael Champagne who have helped transform a city plagued with discrimination and crime into a place of hope and pride for young first nations. When Shane in Maple Creek heard I wanted to see the Cypress Hills but couldn’t afford the time and gave me a personalized tour. When a woman found me on a muddy construction zone in the pouring rain outside Brandon and insisted on driving me into town because lightning was forecast and she feared for my safety. When the two times I had to hitch-hike I was picked up in less than 2 minutes by people who offered to go out of their way to get me back to my route. Everytime I pulled over for rest and someone inevitably stopped just to make sure I was okay. When that border guard spent more time giving me directions and local advice and encouragement than questioning me or searching my gear. When hundreds of school kids sat quietly and patiently and listened to everything I had to say about climate change, and asked brilliant questions I’d never thought of. When reporters changed their plans and went out of their way to tell my story, and thanked me for the opportunity to write about global warming. When government employees pulled me aside to offer me their kudos and tell me environmental concerns despite the possibility of backlash from employers. When they expressed regret that they weren’t brave enough to cut their ties and speak out. When all of these small, wonderful things happened and many, many, more, I was reminded why I remain optimistic. These acts of kindness, compassion, resilience and hope illustrate qualities far more valuable for human civilization and the environment than any amount of acute logic, political persuasion or scientific certainty. With these ingredients in place, it only takes ambition to achieve rapid transformations of our society, culture and indeed our political landscape. Meanwhile, knowledge of the terrifying scope of global warming without this generosity and hope could crush the very spirit that makes us human. What can I possibly hope to achieve? I can’t hope to achieve ‘global radiative equilibrium;’ an end to climate change. I’m scared even to hope that Canada might regain its rightful position as a leader on environmental issues because I’ve been let down so many times already. Next time, that disappointment could be marked by the stinging ineffectiveness of own campaign. But I don’t hesitate to hope that the strength, courage and kindness of Canadians will ultimately triumph over our recent plague of uncomfortable compliance and dangerous inaction. I don’t hesitate to hope that my 5-months on one wheel will inspire others, perhaps even as much as they have inspired me. 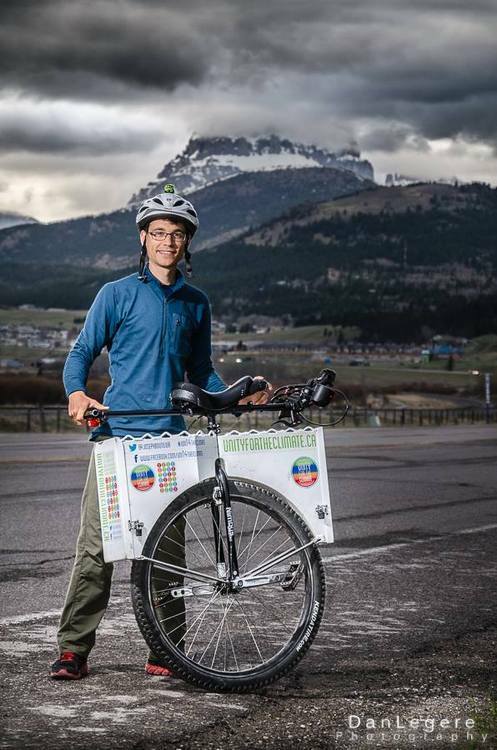 Joseph Boutilier is riding 5,000km on one wheel across Canada to call a heightened political response to the global warming crisis. 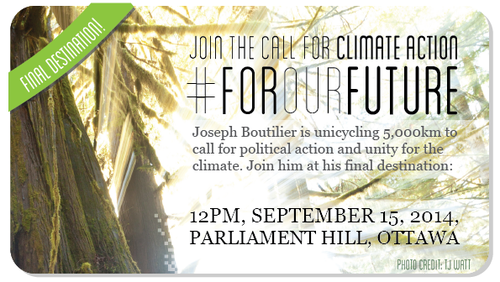 He hopes others will join him to demonstrate their support for climate action when he arrives at Parliament Hill at noon on September 15, 2014. 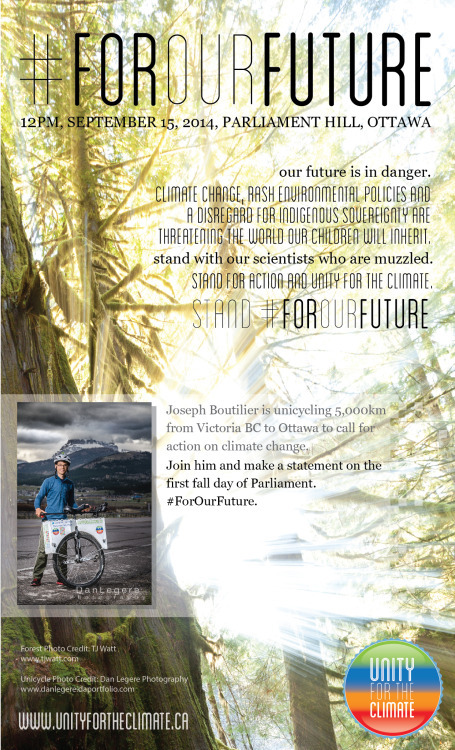 More info is at www.unityfortheclimate.ca and Joseph is on Twitter as @josephboutilier. 09/21/2014 - Yahoo Canada - Some are dubbing it the largest climate change rally in the history of the world. On Sunday afternoon, about 310,000 people converged upon the streets of New York city for the People’s Climate March — an event scheduled to coincide with the U.N. summit on Tuesday — intended “to mobilize political will” towards reducing global carbon emissions. “The atmosphere is buoyant, the atmosphere is jubilant because we recognize that a march of this size…that this changes everything,” May told Yahoo Canada News in a telephone interview from the middle of the march. He also is looking for change to the way Canadian scientists and meteorologists are allowed to discuss environmental findings and changes. He is expected to be heading through the Napanee area September 6th.